Thanks to all of you who reached out to me after my last – rather emotional – post. Every comment and e-mail of support means tons to my husband and me. I wish all of you lived on our street; we could have some pretty crazy block parties. A lot of you suggested ways to connect with other families like ours. 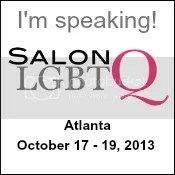 Three cheers for PFLAG! I do attend meetings locally, when I can get a babysitter. I walk away from every meeting feeling so hopeful. Another popular suggestion was the annual Gender Spectrum Conference. And, wouldn’t you know, they reached out to me as well. I can’t attend this year’s conference, but I’m looking forward to attending next year. Here’s more info for those of you who don’t already have big, glamorous plans for July 29 through August 1. A little birdy told me that scholarships are still available. You should look into that. That same birdy should be advised that I’ll need a scholarship next year. Thanks-sies! CALLING ALL GENDER NON-CONFORMING YOUTH AND THEIR FAMILIES! The 2011 Gender Spectrum Family Conference in Berkeley, July 29-August 1, will bring together youth, families and professionals for a weekend of support, learning and celebration of transgender and gender creative young people. The weekend is a transformative experience for all involved. We’ll have more than 30 workshops for adults, Kids Camp for ages 5-8, a brand new Tween Program for children ages 9-11, and our fabulous Teen Program. REGISTER NOW for The 2011 Family Conference or The 2011 Professionals’ Workshop. For more info visit: www.genderspectrum.org, or contact us at info@genderspectrum.org, (510) 567-3977. This entry was posted in All Posts and tagged 2011 Voices of the Year, BlogHer, Gender, gender creative, gender nonconforming, Gender Spectrum, Gender Stereotypes, Orange County, parenting, PFLAG, raising a gay child, Raising gay child, Raising My Rainbow. Bookmark the permalink. being a sensitive child, and even now a sensitive adult (hetero), I believe that I was moderately sheltered, and I believe that that provided the best of the way to grow up in the late 50’s and particularly the 60’s. Those times were ones of generally rigid thought conformity, at least until the later 60’s, and there was not a large place in that world for sensitive children. Fighting among boys was prevelant, and I had my fair share of those. Almost always lost because I didn’t like violence, and I still don’t. However, going to school as a sensitive was also not the most fun, because it was difficult for me to understand some of the ugliness in people. Sensitives are often picked on, because bullies sense this too in them. and see them as easier targets. The problem of course is NOT the sensitives, it is the bullying, and we do not tolerate it in the workplace as adults nor should we be tolerating it for any child, as school is their workplace. This most definately is NOT the way of the world. It is only an expression of SOME of the world. There are some people that never expreience this. Ever. Now to some one would say that’s the way of the world and they need to learn how to deal with it. that is true for the 12-16 year old, but it’s not appropriate for the 4-8 year old. When I was 13, and discovered that the teachers were giving me free license to deal with the bullies on their terms then I began learning another approach and seeing that there were multiple methods of handling these conflicts, rather than the simple unocular way I had been doing. But it wasn’t until I had developed that ability to think through various situations to be able to try different methods that would work, in a logical sequence to deal with those individuals. Start by ignoring, then by trying to talk it out, then by escalating to whatever level of protection I needed to do. And at that point I was still considered weird, LOL, but they never touched me again. What you are is a shouting voice into a void. Until the love you have for your child bade you be silent no more. Because of people like you…..
Congratulations for being recognized for the wonderful person and amazing mother that you are! You are an inspiration and I hope you remember that you are loved, supported and never alone! Thank you for being amazing!! I find it a little creepy the way you’ve latched on to the “gender creative” terminology, which sounds defensive and a bit propagandistic. I don’t see what’s wrong with using the wording you’ve used from the beginning, “slightly effeminate,” which is neutral and descriptive, and “totally fabulous,” which is loving and wry. 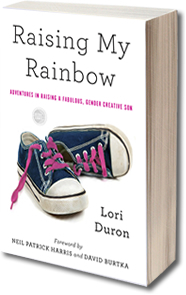 “Gender creative” is tiresome… the fact that your son sometimes acts girly doesn’t make him “creative,” any more than gay people, by being gay, are somehow “challenging restrictive assumptions about sexuality through their revolutionary, transgressive actions,” or whatever. Gay people are gay because they happen to be gay. It’s neither accurate nor helpful to pretend that it’s somehow a triumphant achievement, that C. J. is somehow “better” or more “imaginative” than, say, his brother, which is what the terminology you’ve seized on, which of course was dreamed up by a woman as a marketing ploy to sell books, implies. Your son has to live in the real world, not the world of far-flung commenters from around the globe who sympathize with you on this very specific issue. Instead of ghettoizing him in left-wing queer-theory bubbles like Gender Spectrum conferences, I think it’s more important to teach him what he can share with other people around him, that he’ll like and that they’ll like too. If he *only* wants to play dress-up type games and hates roughhousing or running around, then he may have to find friends who are girls who don’t mind that he’s a boy and whose parents don’t mind, either. That might be hard. He’ll also have to navigate what that means for him when he gets to school. You can’t protect him from the world as it is, and I don’t think it’s all that helpful to try. We all have to live in it. I don’t think your son will think you did him any favors if you home-school him and thoroughly screen anyone he might come into contact with for insufficient broad-mindedness, and then he goes off to college or to work at 18 and suddenly has to come to terms with the world’s ideas about gender just when he’s trying to make a life for himself on his own. Now is the time for him to realize what the world is like. That’s part of growing up. We all face it. Michael, nowhere in my comment did I confuse sexual orientation with gender identity. Nor is criticism of queer theory “homophobic” or “sexist” (see the works and writings of Andrew Sullivan, Jonathan Rauch, Bruce Bawer, etc. ), and calling things by their proper names is an admirable quality in a writer and not otherwise. Nor does my comment indicate anywhere that gender variance makes me “uncomfortable.” The writer of the blog has a comments feature and she encourages the readers to contribute their thoughts. Those are mine. She’s free to ignore them if she sees fit. Certainly it’s an emotional issue, but the author of the blog seems also determined to put serious thought into the matter, rather than reacting purely on an emotional and irrational level, which is more than you have done in response to me. You’ve made assumptions about my feelings and about my personal experiences which cannot be justified by what I actually wrote. I strongly disagree on several points. First, I do not think anyone in his life is “ghettoizing” C.J. and that language is uncalled-for. If you think he’s being sheltered from the harsh realities of the world, I don’t think you’ve been reading this blog – because a couple posts ago there were nothing BUT examples of his exposure to rejection and judgments. I have read examples of this from both his peers and from adults. Has his mother discussed home-schooling to protect him from the harsh realities of the world and insulate him in a bubble until he leaves home? If she has, I missed it. If she hasn’t, why are you speaking as if that were her intention? Additionally, “That’s part of growing up” strikes me as very much the attitude held by those who think bullying is not a problem. “It’s part of growing up,” they say, “those gays should just toughen up. We were all bullied, they just need to learn to deal with it.” Sink or swim, I suppose. I vehemently reject that philosophy. Furthermore, I personally was an extremely sensitive child, and if I had been raised that with that attitude, it very well may have broken me and I probably would not be here today. Now, I am not C.J. – but neither are you. Perhaps that approach works for some, maybe it worked or would have worked for you. But I am quite certain that it does not work for all. Were I raising a son, I would err on the side of moderate sheltering, rather than risk giving him the impression that his family will abandon him to face the cruelty of others alone. For a child who will find most of the world against him, I feel he is better off with a little too much support during his formative years, rather than too little. However, his parents are the only ones who can gauge his sensitivity and readiness to weather the judgments of others. Naturally, only they can or should make this call. Finally: “Now is the time for him to realize what the world is like?” Dude…. he’s FOUR. He is old enough to negotiate some social conflict (mostly, “share with others” and “wait your turn”) but now is the time for growing and playing and learning his ABCs, not tackling society’s homophobia head-on and alone. There will be plenty of time for that later, and he will get plenty enough of it. It’s no crime or disservice to him to be comforted and protected by his mommy when he’s four years old. There will be enough harsh realities later – preferably, AFTER kindergarten. Congrats on making the BlogHer list for this year! 🙂 You more than deserve it! Chin up and remember that anyone who can’t accept CJ for the wonderful kid he is (and you and CJ’s dad for being great parents) is not worth knowing! I am almost hesitant to comment. I’m only bisexual, which allows me a facade of hetero-normality. But the isolation and grief you’re dealing with isn’t lost on a boy who likes boys from the bible belt. I’m from south Mississippi, and as anyone who has been there will tell you, it’s a homophobic place. We’ve got people down here that make Anita Bryant look like Elton John. I deal with a lot of the same depression, isolation you describe in your previous post, and I do so in a most certainly hostile environment. And sometimes it feels like I may just give up. But I read your posts, and realize that there’s hope. If not for me and my generation for the one your son belongs to, and the one he’ll create. That someday this struggle will be something remembered with pride, but not something that must be experienced. It is people like you and your son that will help change the world, so the children I may have someday never have to experience these hardships. For that and for just being an understanding mother you have my admiration, respect, and sincere gratitude. Give C.J. and the rest of your family my best. I’ll be volunteering at the Gender Spectrum conference – I’m curious to meet all these bloggers in person! Hopefully you can make it next year, it’s right up your alley.